Lorenzo Tocci will be presenting his work and new paper at ECOS 2018. The paper entitled A Neural Network approach to the optimal design of radial inflow turbines for ORC applications will be presented Thursday 21 according to the technical program. Organic Rankine Cycle (ORC) is widely considered as a promising technology for the exploitation of low grade thermal energy for the conversion into electrical power. The ORC technology is used to produce electricity from different sources such as biomass, waste heat recovery, solar and geothermal. The design of the turbo-expander of Organic Rankine Cycle systems usually follows the fluid selection and the optimization of the thermodynamic parameters of the cycle. The efficiency of the turbo-expander is usually kept constant at this stage. However, the performance of ORC turbo-expanders are greatly affected by the organic fluid selected and the thermodynamic parameters of the cycle. In this work, a neural network approach is used to derive a model of radial inflow turbines for the prediction of the efficiency of the machine, which can be easily integrated in the fluid selection and thermodynamic optimization process. Entropea’s team will attend this year’s Towards Successful Commercialisation conference. If you’re interested in Waste Heat Recovery, come talk to us Wednesday 18th April 2018, at 1 Drummond Gate, Victoria, London between 08:30 – 19:00. If you’re interested into heat to power technologies and would like to hear what we do, come talk to Dr. Ioannis Pesmazoglou, CTO at Entropea Labs, at Cleantech Innovate 2018. We are happy to be part of Innovate UK’s Hub. 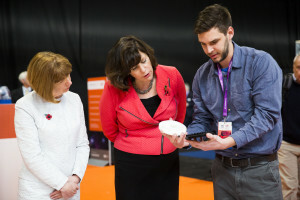 Innovate UK CEO Ruth McKernan and Claire Perry MP, Minister of State at the Department for Business, Energy and Industrial Strategy, talk to Tamas Pal, Business Developer at Entropea Labs, at Innovate 2017 at the NEC, Birmingham, 8 November 2017. Entropea has started a new project for developing an integrated, modular and retrofittable 20kWe ORC system for Heat to Power generation with volume costs not exceeding £2k/kWe. The 18 month Energy Entrepreneurs Fund financed project, entitled Mini-scale Organic Rankine Cycle for Waste Heat Recovery is running between November 2017 and May 2019. Entropea Labs from London has been awarded a place for the third consecutive year at UK’s largest innovation event, Innovate 2017. Dr. Benjamin Franchetti and Tamas Pal from Entropea will attend the ORC 2017 Conference in Milan, the industry’s largest biannual conference. Entropea’s engineer, Lorenzo Tocci will also be there and will present his work on Neural Networks for small scale ORC optimization. As part of a two year Innovate UK funded project (Adapting Waste Heat Recovery Technologies for Low Carbon Off-Highway Vehicles) Entropea Labs has developed in collaboration with Brunel University an ORC based Waste Heat Recovery Technology for small scale diesel engines (200-400kW). The demonstrated technology can increase fuel economy by 10%, is modular, non-invasive and reversible. This enables it to be scaled across the range of new engine production, irrespective of manufacturer, while also being retrofittable to the large number of diesel engines already in service. Moreover, the technology and expertise will be further exploited by adapting it and scaling it to other higher power stationery power generation and transport applications, between 400kW and 2MW. Lorenzo Tocci is attending the Automotive Thermal Recuperation Conference in Berlin, Germany. He will be presenting on Tuesday 25 April Entropea’s Adapting Waste Heat Recovery Technologies for Low Carbon Off-Highway Vehicles project. The conference agenda is available here: Day1 & Day2. Entropea Labs from London has been awarded a place in an exhibition of the most cutting edge innovations from businesses across the country at the UK’s largest innovation show in November, INNOVATE 2016. Come find us between 2nd – 3rd November 2016 at Manchester Central at UK’s largest innovation Showcase. Entropea’s Showcase will be presented at Stand No. B706, next to the Innovate UK Stand. Dr. Benjamin Franchetti is attending the Engine ORC Consortium 2016 Workshop in Belfast, Northern Ireland and presenting Entropea’s paper intitulated Beyond the Thermodynamic Analysis in the ORC Fluid Selection Process for Small Scale Applications. The event’s schedule is available here. The paper Variable geometry turbine performance for off-highway vehicle organic rankine cycle waste heat recovery will be presented at THIESEL 2016 Conference on Thermo-and Fluid Dynamics Processes in Direct Injection Engines Conference on Thermo-and Fluid Dynamics Processes in Direct Injection Engines. The final THIESEL 2016 programme will be available in a few days on the website, here. Lorenzo Tocci will be presenting on Tueday 21 June the paper Thermodynamic and technical criteria for the optimal selection of the working fluid in a mini-ORC at ECOS 2016. Please check the full schedule of the conference and Tuesday’s schedule for details. Entropea’s paper Thermodynamic and technical criteria for the optimal selection of the working fluid in a mini-ORC was published at ECOS 2016. Dr. Franchetti talks about Entropea’s Technologies with Tim Fryer from Eureka magazine. SIF15 – What to expect? Sustainable Innovation Forum 2015 is the biggest side event at cop21 in Paris, France in partnership with United Nations Environment Programme (UNEP). Entropea is attending the 6th annual Sustainable Innovation Forum (SIF15) at COP21 in Paris. UK Trade & Investment will be holding its next Export Week 9-13 November. Across the week there will be a varied series of events all over the UK, aimed at businesses.